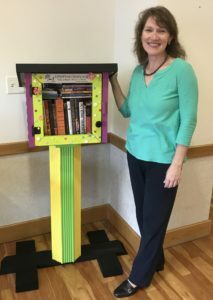 Odessa, TX – Odessa Arts (formerly The Odessa Council for the Arts & Humanities) in conjunction with the Texas Center for the Book, is pleased to announce the donation of the newest Little Free Library at the Texas Oncology Center at Medical Center Hospital. ‘Fighting cancer takes a whole community, not just an individual. It’s our hope that when people see and use this Little Free Library, they will feel the love and support of Odessa cheering them on,’ said Odessa Arts President Elect Rev. Dr. Dawn Weaks. Weaks was celebrating two years cancer free on the day the library was installed at Texas Oncology. Little Free Library is a 501(c)(3) nonprofit organization that aims to inspire a love of reading, build community, and spark creativity by fostering neighborhood book exchanges around the world. There are more than 50,000 registered Little Free Libraries worldwide, in all 50 of the United States and in 70 countries. Through Little Free Libraries, millions of books are exchanged each year, with the aim of increasing access to books for readers of all ages and backgrounds. The Little Free Library nonprofit is based in Hudson, Wisconsin, United States. Established in 1987, the Center for the Book seeks to stimulate public interest in books, reading, literacy and libraries. The Center builds partnerships with library professionals, educators, authors, publishers and booksellers who provide support to our shared mission of promoting a love of literature throughout the Lone Star State. Through the Ellen Noël Art Museum and UTPB’s First Five program, the Oncology Center Little Free Library will be the sixth one in Odessa. Founded in 1978, Odessa Arts exists to support and promote the Arts & Humanities in Odessa and Ector County though Cultural Tourism, Arts Education, and Arts Advocacy.